Leila's years on the carnie circuit were certainly an education. What she didn't learn: how to be a vampire, or how to be married to the most famous vampire of them all. Adjusting to both has Leila teetering on a knife edge between passion and peril, and now the real danger is about to begin . . .
Vlad must battle with a centuries-old enemy whose reach stretches across continents and whose strength equals his own. It isn't like Vlad to feel fear, but he does . . . for Leila, because his enemy knows she is Vlad's greatest weakness. As friend and foe alike align against him—and his overprotectiveness drives Leila away—Vlad's love for his new bride could be the very thing that dooms them both . . .
Vlad is back! I love this man so much. Not only is he the vampire legend come to life, he's ruthless and brutal to protect the ones he loves in his vampire family line. Just make sure to stay on his good side! Lelia's adjusting to her recent vampire change and trying to acclimate to being the wife to such an alpha male. He's a hand full, but it's worth the torture to get some burning hunk-o-love that only this male can deliver. This latest edition to the saga takes a darker turn, there is torture and sexual abuse toward both men and women. So keep that in mind. It gets a bit...gruesome to put it mildly. But that's the darker side of this paranormal world Mrs. Frost has etched out of the most delicious blood on the market. Lots of twists and turns, will have your interest hooked until the very end. Some of our favorite characters come back to make an appearance and help team up with Vlad to take on his greatest enemy to date. Magic abounds and I'm loving this ongoing story with each page. If you love some dark world building, steamy romance, snarky characters and tons of action, then get out and grab this one! But don't start here, you need to read the Night Prince saga from book one! I can't wait to get this on audio. This sounds great! I just finished this one. My review is on Wednesday. Like how pithy your review was. I love Katie's reviews! They always make me laugh. Great review! 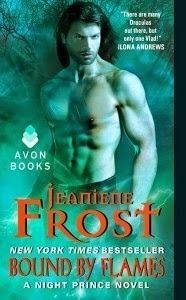 I only have a handful of "must buy" authors, and Jeaniene Frost is one of them. I've totally loved this particular series and can hardly wait for the release of Book 3! Oh I can't wait for this one. I better check that I pre-ordered. ;) thanks for the review. I absolutely love her books. I really need to find time to read this series though. There never seems to be enough time to read all the books I have in my wish list. Thanks for the great review, so looking forward to this one now. Thanks for the review! Now looking forward to reading it. I must be out of the loop - I didn't even know this one was due out! Can't wait to get my hands on it, I love this series and am glad to hear some old friends will be making an appearance in the book. Great review!